A meander through the lush green valleys and hills of the High Weald, in the Kent-Sussex borderlands, dotted with fine examples of rural architecture, dense woods and Henry VIII’s hunting lodge. A fine walk in bluebell season! Underfoot: Unless you are doing this walk at the height of a very dry summer, you will encounter mud on this walk through the clay-soiled Weald – either in some of the woods or on the cow and horse-grazed pastures. Good boots recommended, but there’s plenty of drier stretches and patches of tarmac to stamp them clean! Terrain: This is rolling countryside, so expect a few steady climbs – either side of Balls Green, through Coombe Wood, up to Pyle Gate, plus corresponding descents. Nothing hugely taxing, however. Maps: 1:50,000 Landranger 188 Maidestone & Royal Tunbridge Wells; 1:25,000 Explorer 135 Ashdown Forest and 147 Sevenoaks & Tonbridge.. 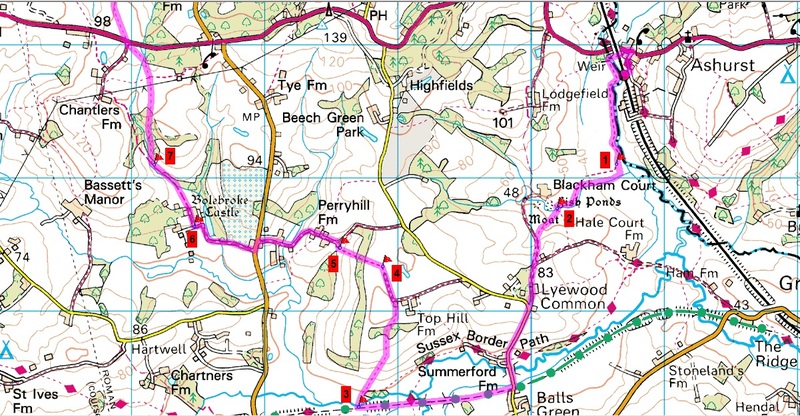 Useful websites: This walk falls within the High Weald Area of Outstanding Natural Beauty, uses part of the Forest Way Country Park, passes Perryhill Orchards and teashop and The Fountain inn in Cowden. Getting there: Despite being situated on a rural branch line, Ashurst is well linked to London, with Southern operating an hourly service direct from London Bridge (50 mins) every hour Monday-Saturday, via East Croydon (35 mins) for connections from London Victoria, Clapham Junction and Tramlink. On Sundays, the hourly trains to Ashurst start from the junction station at Oxted, connecting with a train from London Victoria, Clapham Junction and East Croydon. Total journey time from Victoria to Ashurst on Sundays is around 1hr 4 mins. Getting home: Cowden sits one stop up the line from Ashurst. Monday-Saturday, direct hourly trains run to London Bridge (51 mins), via East Croydon (33 mins) for connections to Clapham Junction, London Victoria and Tramlink. There are also hourly services on Sundays, but requiring a change at Oxted onto a connection service to London Victoria (via East Croydon and Clapham Junction). Total journey time to Victoria on a Sunday is around 1hr 9 mins. Fares: Simply purchase an off-peak day return ticket to Ashurst (ensuring you buy a ticket to Ashurst Kent, not the station of the same name in the New Forest) for £13.80 (child £6.90, railcard £9.10). This will also cover the return journey from Cowden. left along Station Road. On reaching the A264 in the small village, turn left again. Pass Millstream Close and immediately afterwards (shortly before the railway bridge) turn left at a footpath sign, along what starts off as a very narrow path, with the old mill ponds on the left. You pass under the railway to reach a footbridge over the Medway by a fast-flowing weir. Over the bridge (and having left Kent for East Sussex), the path heads left to follow the river southwards. In the middle of the field stand two World War II pillboxes, designed to protect this breach in the hills from an invasion force advancing on London from the south coast. These boxes formed part of what was known as the GHQ Stop Line, aimed at being the point at which a German advance would be halted. The path follows the river around a small meander and reaches a hedge (1), a further pill box hiding among the trees. Through a gateway, a footpath sign points straight across the large field ahead towards another gateway below the buildings of Blackham Court on the hillside beyond. Technically, you should follow this, but when crops are growing it may be more considerate (not to mention easier) to head left from the gate, then right up the field edge (marked by a row of trees along a drainage ditch) to reach the second gateway. footpath sign) to follow a grassy fenced area beside the stream. Ahead are the extensive buildings of Blackham Court, the main house sporting a remarkable expanse of tiles on its pitched roof. The first record of a farm here dates from 1596, when a Richard Saxbies rented 235 acres of ‘haslewood [sic] and the ponds with the orchard’ here, in exchange for a rent of £69 and ‘two fat capons alive on 1st November’. Approaching the buildings of Blackham Court, turn left at a footpath junction sign to cross the stream on a footbridge (2). Immediately beyond the thicket on the other side of the bridge follow the next path junction sign to the right, along a broad grassy swathe. Where the path forks, keep left, into the trees. on the concrete drive climbing gently, again through trees. At the top of the climb merge straight ahead into Dale Court Farm’s tarmac drive, passing attractive seventeenth century Lyewood House and, just beyond, its pond to reach a minor road. Again keep straight ahead, descending rapidly through the woods on the road, passing the entry sign for the village of Withyam (actually some way off) and past Summerford Farm, with a collection of three oast houses. The road crosses the Medway on an old stone bridge. Just beyond, you cross a second stream and the road becomes Station Road. Immediately beyond is the white washed former station building with the old railway in front, now the Forest Way foot and cycle path. Despite the impatience, the line never really prospered, rarely seeing more than six trains per day, though at times these included through services to Victoria and Brighton. By 1962, there were just two season ticket holders for London from Withyam station and despite efforts by British Railways to increase the service, the line was closed by Dr Beeching on 1 January 1967, just over a century from opening. Withyam station is now a private house, while the signal box that once guarded the level crossing here has been moved wholesale to control Sheffield Park station on the nearby preserved Bluebell Railway. The village of Withyam is over half a mile from the former station – the settlement here is Balls Green, which thanks to the construction of council housing post-war, is now larger than diminutive Withyam. climbing a broad path beside a small wood. Cross two stiles (at time of writing, the first is broken) following the waymark straight ahead, then following the clear path leading diagonally up the planted field ahead. As you climb, there are good views back across the valley to Hartfield, with its prominent church spire, and to the high Ashfield Forest plateau beyond. On reaching a hedge near the top of the climb, veer left alongside it (do not pass through the gateway). At the top corner of the field cross a track and follow the footpath sign into Ash Corner Wood. Follow this clear path through the trees to the buildings of Top Hill Farm. Just past a large riding shed, you exit into a track, heading straight ahead (footpath sign). Having passed through a gate, pass through the next gate immediately beyond (waymark) into a sometimes muddy field (4). Head straight towards the wood ahead, keeping left of a fenced-off hollow and over a stile into the trees. Beyond the belt of trees you descend a grassy swathe with fine views to Perryhill Farm and the woods beyond. At the bottom of the hill (5), the path veers briefly right to reach a junction with a bridleway. Here head left on the track up to Perryhill Farm. tarmac drive past an oast house. The drive doglegs down to Bolebrook Farm, again keeping straight ahead past a row of substantial High Weald houses to reach the busy B2026. Cross with care and head left on the verge for 50m before turning right on the Bolebrook Castle drive (bridleway sign). Immediately after the turn is the well-stocked shop and tea room of Perry Hill Orchards, in the former lodge house. Continue along the lovely track, which doglegs past the castle’s lake and past the castle and (the especally fine) gate house itself. Despite the name, Bolebrook Castle never appears to have had any defensive function – rather, this is a late fifteenth century hunting lodge, believed to be one of the earliest brick-built buildings in Sussex. The Ashdown Forest was a popular area for hunting boar and deer, and Henry VIII stayed at Bolebrook on several occasions. However, there are claims that his interest was as much in his courtship of Anne Boleyn, of Hever Castle just five miles away, as it was in the local game. The ‘castle’ is now a private house, but you may catch glimpses in the grounds of the once extensive but now largely dismantled miniature railway network constructed by a former owner. Turn right on the drive up the side of the turreted gatehouse (no sign at the junction). Beyond the gatehouse, follow the broad path ahead between the two garages, leading out of a footgate into a track which you follow straight ahead. through the woods, paralleling the stream before climbing briefly and steeply out of the valley. Keep straight ahead through the upper part of the wood to exit into a field at a stile. Veer left beside the fence, beside the edge of the wood, heading towards an electricity line. Just beyond the line, a gate (waymark) leads into a second field. Cross the main road and head left for a couple of meters before crossing a stile (concrete footpath sign). Head left along the hedge paralleling the road and then follow it to the right, along a line of horse jumps. At the end of this long field pass through the footgate (waymark) into Heathersome’s Wood. The clear path drops gently through the trees, the ponds of the golf course glimpsed below. Where the path forks, follow the waymark right. Keep straight ahead to emerge on the golf course. Keep beside the wood and follow a small path that cuts through a scrubby area ahead. Just after emerging from the scrub, where the edge of the wood veers away to the right, cut straight ahead across the green to a waymark post among the trees ahead. Head left to a second waymark post (marked as the Sussex Border Path) which you follow right to a bridge over Kent Water – appropriately, this leads you back into the county of Kent. along its edge to reach a three way footpath signpost at the corner of the green (9). Head left, through a gate, then follow waymarks right to climb a path between hedges. On reaching a minor road head left, still climbing gently, then steeply, to the edge of Cowden village. At the road junction, head right into the village, with The Fountain inn just round the corner. Past the pub the road swings right again. Continue along the lovely High Street, past the Old Forge and the church. The little village of Cowden is a beautifully preserved High Weald village, having grown prosperous during the sixteenth century thanks to the Weald’s iron industry, gaining its first blast furnace in 1573. With local clays that provide reserves of the iron ore siderite, which could be conveniently smelted using charcoal from the plentiful woodland, iron production in the area dates back to pre-Roman times, but reached a peak in the 16th and 17th centuries, with most cannons used by the British army and navy produced in the Weald until around 1770. The industry died out locally as coke began to be used – far more efficiently – for smelting. The 13th century church of St Mary Magdalene has a fine, wooden shingled spire, while the creator of the Mr Men books, Roger Hargreaves, who lived near Cowden in the 1980s, is buried in its churchyard. Just beyond Crown House (once an inn) and the bus stop on the left hand side of the road, turn left through a kissing gate (footpath sign). Follow a faint path towards the far right hand corner of the field ahead. A stile brings you out by a small white cottage (10). Veer right along the fence in its gravelled parking area to find a footpath sign leading to a broad path running between the wood and a hedge – this may be muddy at first, but soon dries out. waymark post to follow the trees downhill. At the bottom of the hill keep straight ahead to cross the small stream on a footbridge, then immediately begin to climb on the faint path heading diagonally across the grassy field opposite, heading towards the roof of a barn visible over the ridge. On reaching the top corner of the field pass through a gateway (waymark). Follow the right hand hedge around the corner then head for the gap between two metal barns, where a footgate leads into the farmyard. Dogleg left then right past the barns to reach the B2026. Cross the road and follow the footpath sign opposite into Pyle Gate Farm. Keep to the right hand track (faded waymark), swinging left past the beautiful brick and tiled farmhouse, with remarkable chimneys, then right, still on the track, to begin descending, dropping pleasantly and gently beside a wooded stream. right at a triangular junction (12) on a path following the valley (waymark). Ignore the footbridge to the right and continue through the woods. At the next path junction (13) keep right (you can glimpse the portal of the railway tunnel through the trees to your left), passing some immensely tall redwoods. Around a quarter of a mile’s steady walk through lovely woodland brings you out into a road beside a railway bridge. Turn left under the bridge, ignore the footpath to the right and almost immediately turn left on the station approach road – the pretty little station house is 50m up here. As you have just discovered, Cowden station is some distance from the village it claims to serve, and must rank as one of the most remote stations in the south east of England. 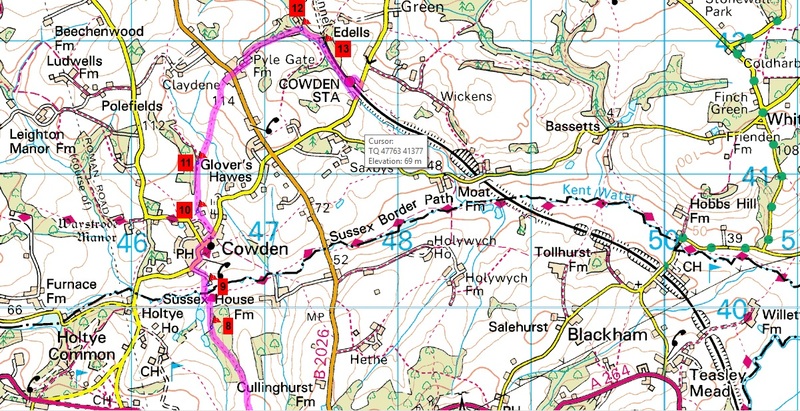 Rather than the dead-end branch it is today, the route through Cowden and Uckfield was, until the 1960s, a through route from London to Lewes and the south coast. Rationalisation after this closure led to the singling of the section through Cowden in 1985 – the disused platform can still be seen across the remaining track. Best not, perhaps, to think too much, while waiting for your train, about the accident that took place nine years after the singling of the line, when two trains collided head-on in the tunnel just north of Cowden, killing five passengers and staff. There is a small memorial plaque on the station building.